A while ago I posted in my Facebook page a nice infographic about the veges that prevent breast cancer. One of the readers commented that all veggies are good for us, but how can she possibly get them all in? Well, that was a good question, and this is why probably smoothies became so popular nowadays. They enable us to consume larger amounts of veges/fruits that we couldn’t have otherwise able to consume. Smoothies also enable us to diversify more what we eat. Normally we find ourselves eating the same foods, but smoothies introduce us more easily to other veggies/fruits by changing the recipe and introducing each time another fruit or vegetable. This time I would like to talk about the green smoothie which became kind of a miracle health drink. It enable us to consume various combinations of greens and vegetables that can improve our health dramatically. The green smoothie is a name made ​​up for a combination of green leaves. The combination can be varied: a combination of lettuce and parsley along with a green vegetable like a cucumber or zucchini, fruit – or any other vegetable. “Beginners” can drink smoothie made of simpler and more conventional combinations, whereas “advanced” can be more daring and incorporate things like flax seeds, almonds, tahini, dates, nuts, and more . Initially you may want to use less dominant flavored vegetables , and later on to diversify and try more flavors and combinations. The health benefits of the green smoothie vary depending on the green leaves you choose. According to recent studies, green smoothie clears toxins, helps in dealing with iron deficiency, cleanse the digestive system, nurtures the skin, prevents diseases, improves vision, helps prevent bad breath, relieves sore throat and more. If you are interested in detoxifying your body, you can find more useful information in my e-book The Detox Guide. This guide will teach you how to use detox to cleanse and energize your body naturally and safely. The main difference between green smoothie to vegetable juice is that smoothie unlike juice contains fiber that helps the body to get rid of its waste products. Because smoothies are made in a blender, they are quick and easy to make, filling and can serve as a light meal. Also the green leaves are a source of protein, an excellent source of iron, minerals, calcium, magnesium, manganese, copper, zinc and potassium. Green smoothie and green juice also contain a large amount of chlorophyll. Chlorophyll is the green pigment in green leaves, fruits and vegetables. It is not just a pigment, it binds to toxins and free radicals and turns them into neutral materials. Studies have shown that it helps in detoxing from heavy metals that tend to accumulate in our body in different places, and has anti cancer properties, that specifically affect the liver. 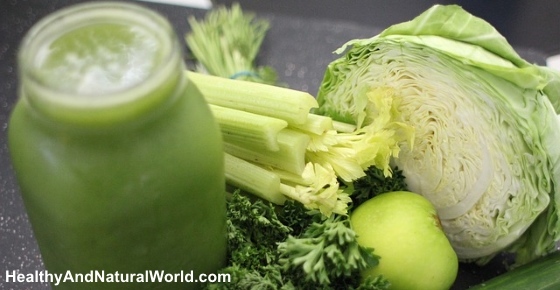 You can find more information about chlorophyll including how to use it in my article on how to detoxify your body using chlorophyll. 5-6 lettuce leaves – lettuce is a vegetable with a neutral taste so it would be good to start with it. Later on you can replace it with leaves that have more dominant flavor. Cool water as needed, depending on the desired consistency. Put all the ingredients in a blender without the water and blend. Add the water gradually until you have reached to the desired consistency. Cool water as needed depending on the desired consistency. Put all the ingredients in a blender without the water, blend and add the water gradually until you have reached the consistency you want. Ingredients: apple, banana, one pitted date, 4 pecans, 4 young lettuce leaves, 2 Swiss chard leaves, a piece of green cabbage and 2 cups of water (other combinations of fruit : a melon with a banana, apple and mango, apple and pineapple). Put the fruits in a blender with a little water and blend , then add the nuts and green leaves. Add water according to the desired consistency. If the fruit contains more water, like a melon, you can add less water to the smoothie. 1. Begin by adding small amounts of leaves and then increase the quantity to get used to the taste. 2. You can put the seeds or nuts in the smoothie itself, or you can scatter them above and chew them. Drink the smoothie slowly, not all at once. 3. It’s best to incorporate a few ingredients, 2-3 fruits, two types of greens and one type of fats. 4. Add dried fruit to sweeten the smoothie, such as dates, dried pineapple, dried apricots, raisins, cranberries. It is best to soak them in a cup of water for 15 minutes to soften them (you can also use the soaking water) and vary them every day or two. 5. If you want your body to benefit from the nutrients that are in various green leaves, it is important to diversify between them and every day or two make a smoothie with other leaves and sprouts. Markets now offer a huge selection of these leaves that can be combined in the smoothie: various kinds of lettuces, chard, spinach, kale, arugula, mustard greens, parsley, dill, celery, cilantro and more. 6. Because most green leaves are sprayed and absorb the pesticides, it is recommended to buy organic leaves. 7. It is also advised to diversify the fatty component. Use each day a different kind of nuts, not roasted of course, such as: almonds, walnuts, pecans, macadamia, hazel, Brazil, cashew and seeds: sesame, sunflower, pumpkin and even a teaspoon of coconut oil. 8. The smoothie is kept in a sealed jar in the refrigerator for two days but to enjoy the health benefits of the greens it’s best to consume it freshly made. 9. You can add spices to your green smoothie, such as, pepper, oregano, basil, turmeric, ginger, cinnamon. Most importantly is to be creative, play with different ingredients and if you happen to have delicious smoothies, share with us the recipe. Drinking green smoothies is also one of the 70 habits featured in my e-book 70 Powerful Habits For A Great Health which will guide you how to take positive steps to improve your wellness and overall health. I love the site and want wait to have some books to read more about it…. Looking forward to learn from you. What’s different between “smoothy” with “juice” ?? Thanks for your info.